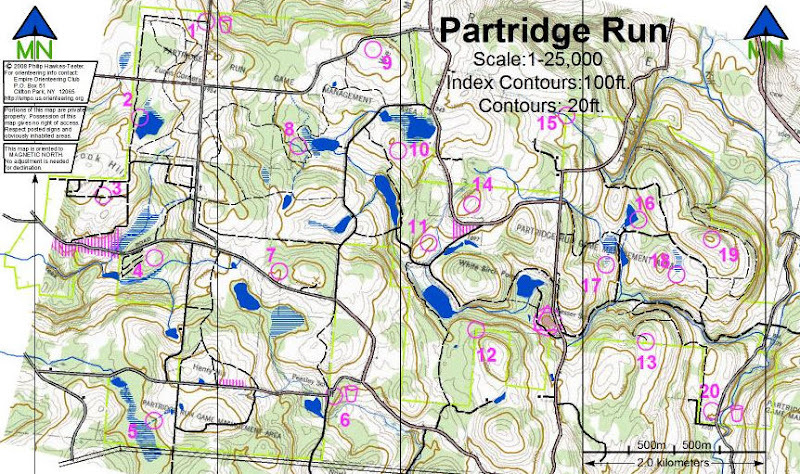 As advertised, this was a first time event: my first time directing any sort of Rogaine, the first time EMPO has tried to use Partridge Run as a venue, and the first time using the map I constructed from various sources (primarily USGS, NYS DEC, and ArcGIS Explorer). We experienced difficulties with all of them, but I think in the end everyone who came out (under the threat of hurricane rains) had a positive experience, and several folks asked if we could add more events like this to our schedule in the future. I had laid out the schedule to get the Rogaine folks off early; then to deal with the Score-O people both out & in; then finally deal with the Rogainers returning. That part of the plan worked quite well from an organizational standpoint. Cynthia Johnson (my main helper) and I were never swamped with people lined up looking to register or anything like that. Of course the numbers were small, so this was hardly a "stress" test. Still, I have reason to believe this arrangement could continue to work. The one downside is that the Rogainers and Score-Oers never got to mingle, and their route discussions might have been an interesting adjunct to the separate discussions that were had. The weather (produced by the far flung influence of Hurricane Hanna), actually cooperated pretty well, with the rain stopping around 8am, and not starting up again until 1-2pm. Early Score-O entrants had little or no rain to deal with; and the Rogainers just had a couple of hours, by which time they were already so wet from going through the wet woods that they hardly noticed. Most who did notice thought it was refreshing! Note that while they are tied in points, Bob beats Stuart on the basis of time. However, Dmitri and Janet are actually exactly tied under the rules as announced. This has taught me to set yet another level of tie-breaker, which I think would be in favor of the one who finds the most controls. But that was not in effect this year, and so they remain tied. Note that the final Score difference appears to have been the result of the difficulty some teams had in finding #10 and #8 in a reasonable amount of time. These controls were not as obviously easy as the "top-of-the-hill" controls, but I still think were accurately placed, though I recognize (and the "Map & Course Notes" clearly stated) that the trails around them were at best an approximation. Also, while it gains them nothing in their score, I should note that the winning team arrived late, and actually started 30-35 minutes after the others. It was interesting to observe their approach in that circumstance: they didn't panic or rush; they just went about getting ready, and when they really were ready, they went off. And, quite evidently they were still able to move faster and more accurately than the rest of the field. I plan to follow both of these suggestions when I host another such event. Given time (like, a year or so), I may be able to further improve the map, so that I can eliminate the USGS template, thus be able to fix some of the more obvious contour issues, and get several of the major trails in better shape. However, like everyone else, my focus is somewhat limited. So I [and EMPO in general] need to hear from you about the sort of events you wish that we would hold, and to which you would come. Thus the question is: do you want EMPO to host more LONG events (2-6 hours), such as this recent Mini-Rogaine; or are you only interested in our more common events (1-2 hours). Your interests really will drive what we produce, so please let us know.